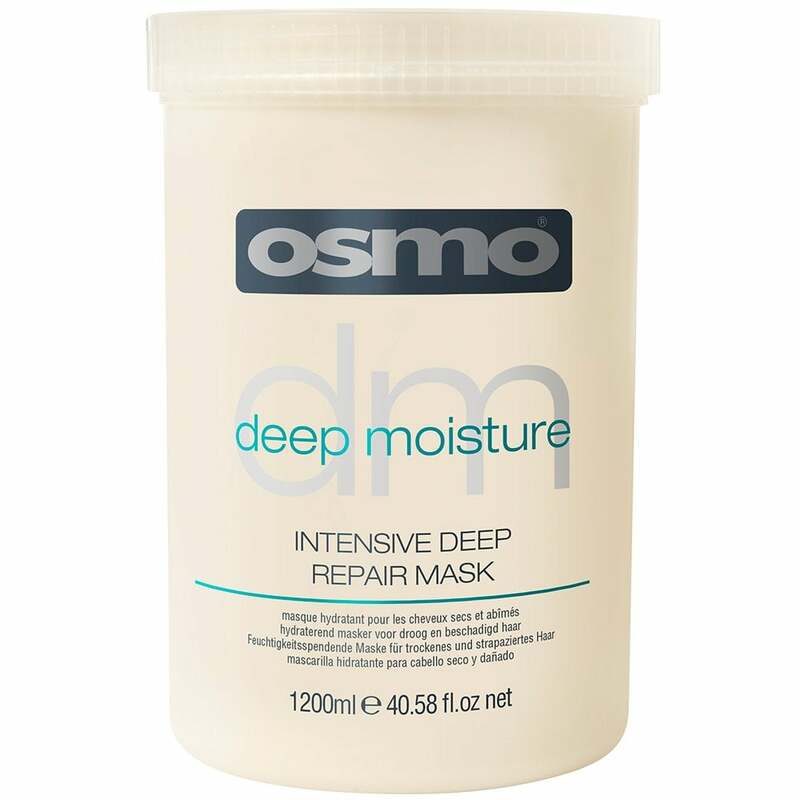 Osmo Intensive Deep Repair Mask (1200ml) is a deep nourishing treatment which will restore the moisture balance and elasticity of your hair. Jojoba provides a rich source of vitamins to hydrate even severely damaged hair. Will leave hair looking silky, healthy and shiny whilst also feeling nourished and manageable. Perfect for dry, permed, coloured hair at any length. Work a small amount into shampooed and towel dried hair. Leave on for 3 minutes, then rinse thoroughly. Review Summary - 4.8 out of 5 based on 101 ratings. My friend recommended this to me a few years ago! It moisturises the hair so much without making it feel heavy or greasy. The instructions recommend leaving it on for 10 minutes or so but I think this works better as an overnight mask. I apply it from the mid lengths to the end of my hair then wash it out when I wash my hair the next morning. I always get compliments on how healthy and sleek my (extremely bleached) hair looks. I absolutely love this product. It is the best conditioning treatment I have ever used. This is a very good mask and just as good as really expensive brands. Looks and feels like butter but rinses out well adn leaves hair soft and shiny. Can't believe the size of the tub. I have badly damaged hair due to a hairdresser that burnt my hair, it was breaking off all over the sink. This was recommended to me by another hairdresser. After 1 treatment my hair was much softer & felt much healthier. It has restored the sheen & rebuilding my hair. Was recommended this hair mask treatment from a friend then my hairdresser. I use this once a week and my hair feels nourished and healthy after using it. I completely recommend this product and it's a fantastic price on just my look. The best hair mask,love this product. I highly recommend it. Have been buying this product for years from a local shop, which has unfortunately closed. So I was pleased to find this product for sale on your web site , and what's more, cheaper. I have my hair highlighted regularly, and this product leaves my hair feeling nice and silky. Only fault lies with delivery, the container was split on the base and some of the product had leaked out. Good job this is a thick product and not runny. Will not put me off purchasing for a second time though. I love this product and bought this at a very good price. However even though it was covered in bubble wrap, I received the package damaged, with the container smashed at the bottom. I will have to move the product to another container in order to be able to use it. Very disappointed but feel JustMyLook did try and package it to prevent damage. Firstly Can’t believe the size of this tub for the price. Don’t be worried about it being cheap this treatment is the best on the market. I have bleached blonde hair and this literally feels like I’ve had a professional treatment done at the hairdressers. It’s silky smooth and shines. I also feel it’s less frizzy aswell. Love this product. Great for over bleached hair. My hair is very damaged and this softens it up and even makes it more manageable and smoother, I don't have to straighten it as much as it straightens up a lot of my kinks as well. Such a good price and genuine products great website, thanks osmo and justmylook! Arrived quickly well packaged. Leaves hair in beautiful soft condition and you only need a small amount. Best conditioner mask ive ever used,saved my broken blonde hair after loosing 4 inches of length. Sadly my tub arrive cracked along the bottom. Made my hair really soft and smooth. Best intensive hair treatment ever ! Great product and low price. I have long thick blonde hair which has been bleached and coloured for nearly 20 years. My hairline/baby hair bare the brunt of abuse as it’s also straightened with ghd’s. I apply this hair mask liberally all around my hairline and the ends. I use a silver conditioner for the rest of my hair, then leave the conditioners on overnight. The Osmo mask is unbelievable! Leaves my hair soft and shiny when dried. It’s fantastic! Don’t be put off by its consistency. It’s very thick/dense, but rubbing it between your fingers warms and loosens it so makes easier to apply. A little goes a long way, but in my opinion you can’t go wrong using extra as it doesn’t/hasn’t left my hair greasy. Fantastic product, and fantastic value for money. This is fabulous for my hair which is natural curly with highlights. Its been particularly dry recently because of my health & nothing worked.My hairdresser used it & left it to work for 20 minutes-I was amazed with results! Really makes a difference. Love it! My hair was feeling a bit dry but after one use of this it felt silky smooth! I couldn’t believe the size of the tub! Very good value for money,recently bleached my hair and it was very dry and after 2 uses of this it feels back to normal. Great value, really thick, nourishing and smells heavenly! Love this! Makes my hair feel lovely and soft. My hairs never felt so good! I lost hope my hair was always tacky and snapping, I turned to my friend who is a hair dresser and she introduced me to this. I’ll never go back! Great for my wife's dried hair. I've been using it for years, it's a great product at a decent price. Love it! Wrong item received. Quite disappointed with the service. I will not use this company again as I still havent received the correct item, couldn’t reach customer service and received an email after 2 days. Excellent product, this has really help improve my dry ends, i try to use a few times a week, I have naturally very curly hair, that needs a lot of moisture. I will definitely buy this again. Such a good product for such a small price! It makes my hair feel so soft. When it came the container was cracked and I had to put the product into my own container.